4The modern edition of the text is Zsigmond Kemény, Változatok a történelemre (Budapest: Szépirodalmi, 1982), pp. 185–373, the excerpts used are from pp. 366–373. 5Zsigmond Kemény [1814, Alvinc (Rom. Vinţul de Jos; in Transylvania, presentday Romania) – 1875, Pusztakamarás (Rom. Cămăraşul, in Transylvania)]: novelist, essayist, politician. Kemény was the descendant of an ancient Transylvanian aristocratic family. He was educated at the famous Calvinist College in Nagyenyed (Rom. Aiud, present-day Romania), where he studied law and philosophy. In 1837 he moved to Marosvásárhely (Rom. Târgu Mureş, present-day Romania), where he became an apprentice lawyer, and in 1838 to Kolozsvár (Rom. Cluj, Ger. Klausenburg, present-day Romania), where he became clerk in the Governor-General’s office. In 1839 he went to Vienna, where he spent a year and a half, attending lectures at the University and preparing for a literary career. Over the next decade he became acquainted with the most important political and cultural figures of his generation and edited the journal Erdélyi Híradó (Transylvanian Herald). In 1847 he settled in Pest and worked on the staff of the liberal Pesti Hírlap (Pest Gazette). As parliamentary representative of the Kolozsvár district he was involved in the revolutionary events of 1848. Moving to Pest, and then following the government to Debrecen, he served as adviser to the Ministry of Interior until the very end of the revolutionary struggle. After the defeat he went into hiding, but later surrendered to the Austrian authorities in Pest, who, after two years of investigation, finally dismissed the case against him. In the 1850s he edited the influential journal Pesti Napló (Pest Journal). In the 1860s he supported the moderate line of Ferenc Deák against Lajos Kossuth. With his belletristic works, especially his historical novels focusing on Transylvania, he gained a distinguished reputation as a prose writer. His essays and novels, written in an unmistakable style, are often considered the best expressions of Hungarian Late Romanticism. 6Main works: A mohácsi veszedelem okairól [On the causes of the catastrophe of Mohács] (1838); Korteskedés és ellenszerei [Electioneering and its antidotes] (1843); Gyulai Pál (1847); Forradalom után [After the revolution] (1850); Még egy szó a forradalom után [One more word after the revolution] (1851); A szív örvényei [The vortices of the heart] (1851); Özvegy és leánya [The widow and her daughter] (1855– 1857); A rajongók [The enthusiasts] (1858); Zord idő [Murky times] (1858–1862); Tanulmányai [Studies] (1870). 7The Transylvanian aristocrat and writer Zsigmond Kemény was a supporter of the liberal movement in the 1840s, developing a reformist program convergent with that of the ‘Centralists’ around József Eötvös. Though he served the revolutionary government until the very end, he grew increasingly disenchanted as the revolution radicalized, blaming Kossuth for abandoning the more organic style of reform and for subordinating the common good to his personal “dictatorial aspirations.” After the collapse of the revolution Kemény’s was among the first critical voices to be heard in the midst of collective trauma and Austrian reprisals. Kemény positioned himself in a very precarious way. While he harshly criticized the revolutionary leadership, he also opposed the aristocratic ‘old-conservative’ political platform, which tried to resume politics as if the Revolution of 1848 had not taken place. Against both, Kemény sought to defend the liberal reforms and considered the formation of a modern ‘bourgeois society’ crucial for the survival of the nation. He maintained some hope of the modernizing potential of the ‘neoabsolutist’ government of Vienna, which was partially drawn from politicians (like the Prime Minister, Alexander Bach, for example) who had a liberal political past. While most of the Hungarian liberal cultural-political elite of the previous decade was either in emigration or adopted a position of ‘passive resistance,’ rejecting any form of cooperation with the government, Kemény did not exclude the possibility of convincing Vienna of the necessity of continuing the modernization of Hungarian society, even if such a policy might stem from the logic of adminstrative rationality and not from liberal doctrines. 8Along these lines, Kemény’s political essays as well as his historical novels, written in the 1850s, were meant to actively ‘shape the public’ and reconsider the basic tenets of the Hungarian national discourse. On the one hand, he evoked the tragic moments of the past when the Hungarian nation went through similar ordeals as after 1849, thus seeking to create a historical perspective for the contemporary situation. One the other hand, he sought to convince his audience of the historical and geo-political necessity of cooperating with Austria, pointing out that, due to the complex ethno-national composition of the region, Hungary could retain its territorial integrity only in the framework of the Habsburg Monarchy. 9The pamphlets ‘After the revolution’ and ‘One more word after the revolution’ are usually considered the most characteristic instances of the conservative potentials of Hungarian ‘political Romanticism.’ With a sweeping rhetoric of collective self-criticism Kemény called the nation to repentance after the “excesses” of the revolution and envisioned a model of cooperation with the Viennese administration which would allow Hungarian society to recover what it had lost during the upheavals. He couched this argument in an organicist discursive framework, flavored with a considerable dose of historical pessimism. Nevertheless, this rhetoric was eventually turned to support a vision of moderate liberalism focusing on the concept of balance (súlyegyen), whereby he suggested that progress is based on the intricate interplay of revolutionary radicalism and conservativism. Thus, in discursive terms his works might well be defined as Romantic, although the author’s political program contained elements characteristic of the Enlightenment (with frequent references to Montesquieu and Rousseau) and also prefigured some ‘modernist-institutionalist’ claims—an ideological mixture being characteristic of nineteenth-century Hungarian liberalism. 10In the concluding pages of ‘After the revolution’ Kemény recapitulates his entire argument. Showing how the nation faces the threat of disappearance, he calls on all political camps of the country to exercise self-restraint and at the same time to face the realities of defeat. Turning rhetorically to the Austrian authorities, he asserts that relaxation of military control would not lead to a new revolt, as the character of the Hungarians does not contain any propensity for waging guerilla warfare after a lost struggle. Turning to his compatriots, he warns them against “day-dreams,” that is, making common cause with some combination of foreign interests and hoping to reactivate the revolutionary fight. While pointing out the responsibility of individuals and social groups implicated in the revolution, he also asserts that the defeat was predetermined by the differences in the balance of strength between the Empire and the Hungarians, making it vain to seek to identify some individual mistake as the root of the collapse. Furthermore, he argues that national regeneration should be based on collective remembrance and the reconsideration of the national past. Finally, he envisions a new common ground of political cooperation of all the forces committed to the national cause. They should search for ways of healing the wounds of the civil war and embrace policies which take into account the interests of the Hungarian nation, the geopolitical situation of the country—as rooted in the irrevocable unity of the Empire— and the dangers of radical European ideological trends (like socialism) which, by negating the civilizing process, the constitutional framework, and the principle of private property, undermine the basis of society. 11After its appearance, the pamphlet was harshly criticized by many prominent figures from the revolutionary days. While the aims of the author might have been conditioned more by considerations of finding a modus vivendi with the Habsburg administration, it turned out to be a paradigmatic text of cultural and political self-positioning. It had an enormous impact and inspired many later works, among them Gyula Szekfű’s ‘The three generations’ and László Németh’s essays. On the whole, it can be considered as an important, although far from mainstream, version of the ‘national Romantic’ discursive paradigm in Hungarian culture. 13I shall relate then what the aim of this pamphlet has been. 151, It was my modest wish to admonish those high-born ones whom destiny gave indeed much, although not everything, in shaping the future of our nation; then, to admonish all who support the cause of well-ordered freedom, and tell them that despite the recent revolution our homeland possesses so many elements of moderation, this people can provide so much evidence of sober and sedate thinking, and the nation shelters in her bosom so many imperishable materials of order and stability—applying this word in its noblest sense—that we may no longer entertain any doubt that whoever has at heart the survival and flourishing of the Monarchy should bestow extraordinary care upon promoting the interests of Hungary and the Hungarian nation. 162, I intended to tell my compatriots that due to the calamities of the past years a fanciful direction of patriotism may develop now amongst us which feasts the eyes of imagination on distant realms, turning the attention towards the East and the West, dissolving in empty longings and still cherishing hopes about changes that can never take place and would not be useful anyway. 17I am well aware that the number of those who cherish such idle yearnings is relatively small among the intelligentsia. 18I am well aware that it is diminishing day by day. 19But since many are disappointed, should I not cry out, should I not repeat myself over and over with an anxious heart, calling on them to abandon these fruitless musings which, just as the wind sweeps through the chicory, waft their humors without a firm standpoint on and on in a desert, where they shall encounter nothing but the mirage of empty longings—these perfidious visions in the air which depart further from the wanderer at every step. Do not nurture the wish to row on the sea of mirages and to find refreshment in its cool waves! For it is indeed impossible. 20I am well aware that even the few of us, with hardly any exception, who hope to improve our conditions through an external impulse seek not a complete upheaval. 21Nearly every member of the intelligentsia in our land has enough practical sense not to wish to sow the wind so as to avoid reaping the whirlwind again. 22Any one of us has seen enough from the blood-filled scenes of the revolution to reject the delusive images of a second one. 23Yet many of us now believe foreign diplomacy—which Kossuth in his terrible carelessness regarded as insignificant—will be our panacea. 24They cast the anchor of their hopes upon the power of European relations. 26Yet such a policy of building castles in the air can hardly have any other effect but to keep all active forces numb, to neglect the necessities of real life and to long for the plums to fall into open mouths—a longing that may whet the appetite of the indolent but can hardly satisfy it. 273, I wanted to disclose what life murmurs with a thousand voices into the unbiased ear—that great mistakes have been committed even by those who were our party leaders, some of whom have since then disappeared from the horizon for good, while others are wandering on the shores of the Hellespont, beyond the mountains of Asia Minor, in the maze of London and Paris and among the virgin forests of North America. 28On the other hand, it is indisputable that within the ranks of those who have remained here one can encounter men whose bosom still cherishes the Vestal flames of patriotism and who can guard and sustain the public good by thoughts and deeds. 29We have lost; but let us not lose our self-confidence. 30The ravages and loss amounting to hundreds of millions, the destruction of populous towns by fire, the razing of industrious villages to the ground, the devastated forests, the pillaged granaries, the resulting lack of draft animals and means of industrial production and all the lesser and greater calamities of civil war that now bring a tear into even the most insensitive eyes will be forgotten and retrieved in a few years. But if we lose our faith in ourselves, if we begin to doubt that vigor and industriousness can make us the masters of our own fortune, if we expect a few men—who can no longer help us—to be the pledges of our future instead of the nation as it exists, the collectivity of the living and active patriots who have stayed here—oh, then we shall never repair the dreadful effects of two short years, then the arrow has hit the nation’s heart and split into two her artery, for those who abandon their dignity will surely be abandoned by the gods. 31Let us have confidence in our work, in our inner utilizable energies. 32Let us expect and have hope of everything from our vigilance, industriousness and prudence. 33Let us seek here and not elsewhere the political direction to be followed, let us not expect it from others but only from ourselves. 34This is what I kept in view while writing this pamphlet, and it is with this in view that the nation should determine her future course of action. 354, My work has been chiefly concerned with the history of ideas, aiming to present succinctly but faithfully the main questions that have mobilized the Hungarian public in the last twenty-five years. 36The sketch I have offered about our situation makes it obvious that our present condition is essentially different from previous ones. 37We must extend our politics. 38We must forget and study, but we must remember as well. 39Those who do not forget will fight for prejudices and unattainable things whose days are long gone. 40Those who do not study will be unable to choose the right area of activity and the means thereto. 41Those who do not remember will entirely lack a historical basis in their constructions; and yet to be sure in this country with its eight-hundred-yearold constitutional tradition no one will achieve anything enduring if he totally ignores the past. 425, When I drew up an outline of the development of ideas, it was my aim to judge with unbiased severity the activities of all parties and even party factions. 44I shall account for my procedure. 45I wished to display how, from 1825 until the Battle of Temesvár and the capitulation at Világosvár when all roles came to an end, every party, including the conservatives, the opposition, the Centralists, the pre-February radicals, Batthyány’s2 majority, the fragments of moderate revolutionaries (not to mention the ultra-revolutionaries), together or one after the other, all made great slips, mistakes and misdemeanors. 46None is exempt from the charges. 47Mistakes were made by our adversaries and made by us as well. 48It would indeed be no good to compete for the wreath of immaculacy; I mean here not the immaculacy of the heart but that of discernment. 49And it would be a flagrant injustice to lay all responsibility for the consequences, whether with respect to the omissions or the things done, on the shoulders of any one party. 50We have always loved our homeland; although we have often served her ill.
51But on the other hand, just as some inert persons and anarchists, some obstinate and subversive men have always and every time done nothing but harm; just as history and living people will blame individuals—and may destiny grant us that the words of blame resound in the ears of our grandchildren as deterrent—: by the same token, the parties together and successively turned to reality beneficent wishes and destructed harmful aspirations. One served creation, while the other worked on sustenance. Each of them sacrificed upon the altar of the homeland in their own ways; the heavens often received favorably the sacrifices from each of them. And surely it would be a sign of great conceit from any of the parties to still try to monopolize, even now when we have mutually had ample opportunities for disillusionment, the reputation of patriotism and efficiency. None of them remained on the battleground; each party has been swept away by the tempest of the events. More or less guilty, more or less innocent… none of them are fortunate. 52But after all, the Hungarian nation is still alive, and the monarchy, without whom we have no future, still survives. 53So we must think about the things to be done; for pining and numbness are poor substitutes for life. 54We must make the land we inhabit more beautiful, richer and mightier. 55The wounds of civil war are to be healed. 56The ruins are to be cleared out and repaired. 57And how much new construction is needed! 58Another question is: who are the masons of the future? 59Who shall help this poor, defaced country? 60Who shall get us out of our complications and lead us straight to our goals? 61Who shall help us become a useful complementary part of the empire and a flourishing country? 62This requires the mutual co-operation of all the forces within the empire. 63And as for our land? 64As for our country, we need none of the parties – exclusively. 65We have not diminished in numbers, we have not changed in our conditions just to let ourselves, fragmentary as we are, be split into even smaller fragments by the same old animosities. 66The homeland needs no anarchists, doctrinaire revolutionaries, rotten individuals and men clasping their hands over each other. 67But, since the objects of the party feuds have mostly disappeared anyway, the homeland does require of every man of ability, every usable authority of the parties among the sensible and decent politicians from the whole country that they work together in co-operation. 68And what are the fundamental points of this work? 70b, to realize, within the necessary limitations, the imperial unity without which Austria cannot be a great power, and which is a vital requisite of our survival, not only because of the March Constitution3 but also because of the irrevocable nature of things. 71c, to shield the fundaments of society from the invasion of destructive European tendencies threatening it in its most basic components; for the triumph of a Socialist uprising would elsewhere endanger the development of the bourgeoisie, public institutions and property, while here it would threaten the very existence of the Hungarian nation as well. This is the conclusion of the present pamphlet. […]. 2 Count Lajos Batthyány (1806–1849), the first Prime Minister of the revolutionary government in 1848. 3 The ‘Olmütz Constitution’ of 1849, which sought to secure the unity of the Empire by a radical administrative reorganization. KEMÉNY, Zsigmond. After the revolution In : National Romanticism: The Formation of National Movements : Discourses of Collective Identity in Central and Southeast Europe 1770–1945, volume II [en ligne]. Budapest : Central European University Press, 2007 (généré le 18 avril 2019). Disponible sur Internet : <http://books.openedition.org/ceup/2383?mobile=1>. ISBN : 9786155211249. Kemény, Zsigmond. “After the revolution”. Trencsényi, Balázs, et Michal Kopecek. 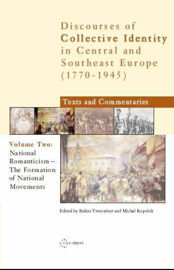 National Romanticism: The Formation of National Movements : Discourses of Collective Identity in Central and Southeast Europe 1770–1945, volume II. Budapest : Central European University Press, 2007. (pp. 455-462) Web. <http://books.openedition.org/ceup/2383?mobile=1>.